I already wrote up a route taking you from the city center (Duomo) to the old harbor neighborhood called the Navigli. 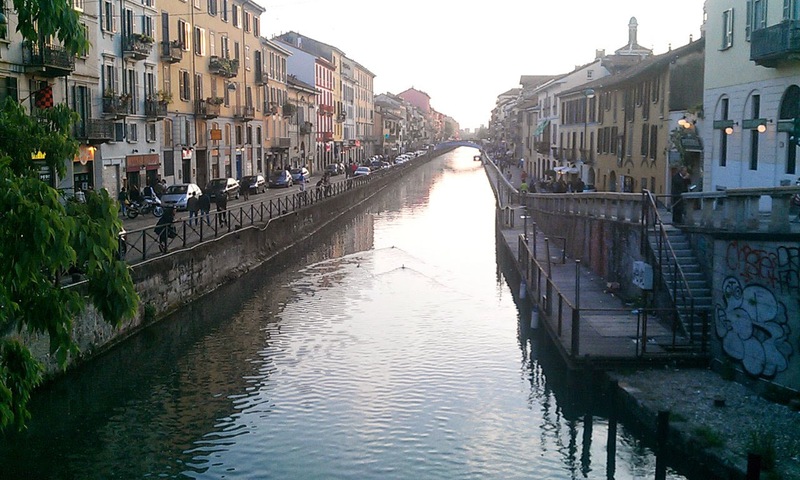 Here's an extension that takes you further out Naviglio Grande, the main canal linking Milan to the outside world. The Navigli neighborhood has come into its own, as the coolest area for nightlife in town, and more hotels have opened up there. So if you're staying in the area, here's a simple route following the canal westwards. 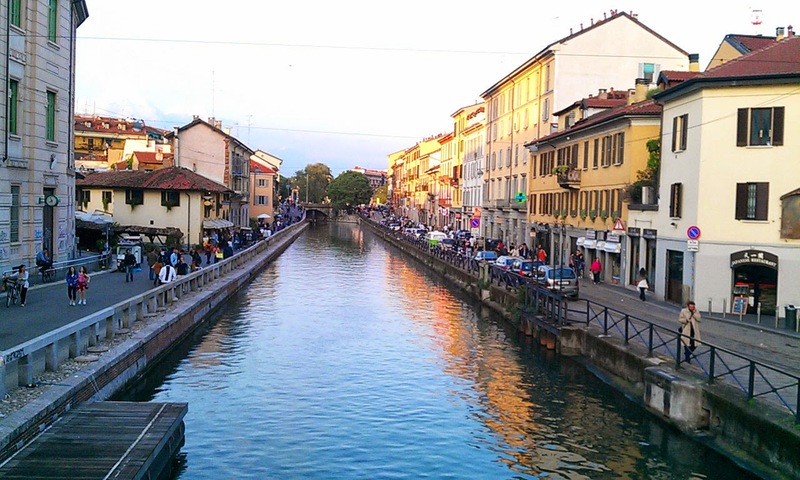 The Naviglio Grande canal is more than 700 years old, connecting Milan with the Ticino river, 50 kilometers away. It's used for both irrigation and transport, but the last commercial barges to use the canal stopped running in 1979. It had some prominent planners: Leonardo da Vinci invented the technique to flood- and clear the boat locks. But there is a movement afoot to reanimate the canal and the nearby Darsena harbor, and the city has been renovating the Darsena docks and Naviglio Grande around Porta Ticinese. This route overlaps a bit of the Navigli route, starting at Darsena harbor at the beginning of the canal. Another canal, Naviglio Pavese, exits Darsena to the south. Start of the run. Run along the right side. Roads line each side of Naviglio Grande as it heads westwards. But the street lining the north side of the canal, Alzaia Naviglio Grande, is the quietest, with much less traffic. The south side road (Ripa di Porta Ticinese) is used by buses and lots of cars, so let's just run out-and-back along the north edge. Standing there, with the harbor basin of Darsena behind you, and Alzaia Naviglio Grande stretching westwards next to the canal, start running. The first 700-meter section of the canal is the most scenic, lined by the restaurants and bars that give the Navigli neighborhood its reputation for lively waterside evenings. You'll run past two little foot-bridges that cross the canal. Then you'll come to a car-and-tram bridge at the 700-meter mark. There is a pedestrian path that goes under the bridge, but that was closed when I ran it last week due to the reconstruction of the canal's side-walls. In fact, the whole next kilometer of the canal was a construction site, with barriers narrowing the street for quite a while. NOTE: The canal has been emptied of water during the reconstruction! The canal, missing its water! After the car bridge, Alzaia Naviglio Grande becomes a popular bicycle trail (but, as I mentioned the first 300 meters are very narrow at the moment. The neighborhood becomes more industrial here. At about 1.4 kilometers, you'll come to a modern car bridge which passes overhead, followed by a steel railroad bridge. The first of several rowing clubs is located just before the railroad bridge. 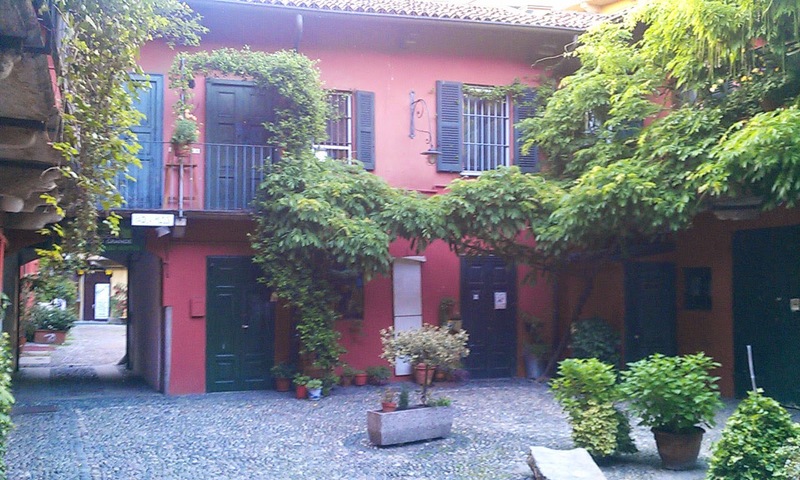 After the railroad bridge, you'll run past a scenic old church, St. Cristoforo sul Naviglio. You'll probably notice a lot more runners around this area: it's a fairly popular running trail, due to the athletes from the rowing clubs located just ahead. On nice evenings, (and when there is water in the canal!) you'll pass club boats along the canal. In just a couple of blocks, you'll pass the Club Canottieri Olona, then a few blocks later the much bigger Canottieri Milano. This last club owns the whole section of the canal-front until our turn-around spot at the next bridge. Besides rowing, they offer a variety of sports in their various gyms.